A few visitors asked for a trial, thinking our charts look too good to be true. 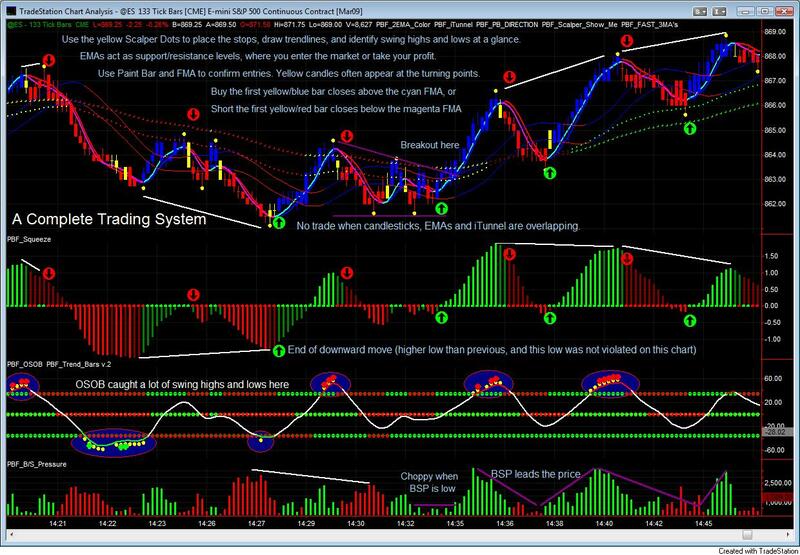 They want to see how the indicators work live with their own eyes, and to make sure that the indicators don't go back in time to re-plot themselves. For this purpose, we have recorded a couple of 5-minute videos live, with a chart below them explaining what we saw in real time. (The screen recording software we used has a 5-minute limit, and the website has a 10 MB upload limit per clip. The chart will load after the videos are loaded behind the scene, might take a minute). The date was January 28th, 2009, after the FOMC announcement. You can pull out your own chart and compare it with ours. It will be the same. (Central Time on charts). We don't offer trials for the following reasons. We are, first and foremost, traders like you, not a big indicators company like many others. This website business, as stated in the "About Us" page, was an accident. After years of research, we believe we have found a simple methodology to trade the market effectively, and would like to share the system with those who believe in it. Our priority is still to trade and grow our own accounts. We trade during market hours, and begin to answer questions and requests after the markets are closed. We would like to spend our spare time on existing customers, help them better understnd our system if they need any, rather than coding for tire kickers. We are pretty committed to the successes of our customers in trading our system. No questions or requests are left unanswered (unless you abuse it, asking for 100 charts at a time). Many of the testimonials can vouch for this. Besides, there were people took our generousity and kindness, abused it and used it to their advantages when we DID offer free trial in the past. They hired someone to open the codes and never paid for our efforts. What's worse, one of them was selling our indicators for more than what we were offering. Lawyers were involved and it was a painful experience we do not wish to experience again. Once bitten, twice shy, and we have been bitten more than once for our generousity. This is the trading world, and we understand there will always be people who try to profit from others' efforts. For these reasons, we decided to cease the offer of free trial for our own protection. We hope you could relate and understand. On that note, do NOT purchase indicators from those who don't know how to use them, or if you can't get full support from them. We can not stress this enough! Even if it's cheaper, the couple of hundred dollars you are trying to save could potential cost you thousands of dollars or more down the road. This is trading we are talking about after all. We all know how much can be made or lost in the blink of an eye. We posted so many charts on the website, and accept requests for sample charts so you can compare them with what you are currently trading with. We are pretty certain you have never seen so many chart examples from any of the trading indicator/system websites you have visited. Now we have a couple of video clips for your enjoyment. Everything is laid out on the pages for your review, there is nothing to hide. You will see that our indicators do not change the plot after the effect to make the charts look good, so what you see is what you get, (with the exception of the yellow Scalper ShowMe dots, which wait for approximately two to three bars to plot depending on price action. It's the only way it can find the swing highs and lows with near 100% accuracy). You will see the two most important aspects of our system from these videos: FAST reaction to the price without much lag, yet SMOOTH to filter out most noises, two effects that usually can not coexist in an indicator. (Usually fast = noisy, smooth = lag). When you purchase our system, you will learn how to trade with the indicators and think like us in real time with our dedicated support. What we wrote on the chart are just some very basic ideas. You will learn all the nuances in our manuals.